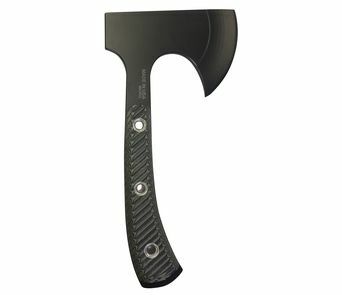 The Porterfield “Cross Creek” Camp Axe is a great companion on short excursions or extended arduous journeys where durability is crucial and the 1 lb., 11 oz. weight keeps your pack manageable. Made with 80CRV2 High Carbon steel which is an excellent choice due to its unique properties allowing it to hold an edge extremely well, while remaining easy to sharpen in the field. The scales are made of textured G10 material with Stainless Steel fasteners for superior ruggedness and grip. 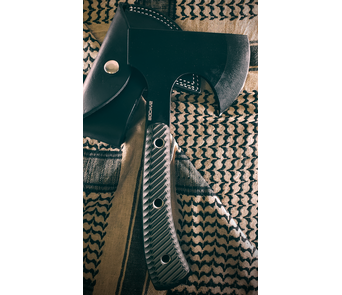 The Cross Creek Camp Axe gets it its namesake from the legendary Cross Creek region of North Central Florida. This region is the location of major battles between the Spanish and the Seminole Tribes. Marjorie Kinnan Rawlings made the region famous with her award winning novels about the unique swamps, wildlife and the resourceful, hard living pioneers who settled in the late eighteenth century, home of the original Florida Cracker. The Cross Creek Camp Axe pays due homage to a rugged, beautiful landscape of swamp and waterways canopied by ancient Spanish moss ridden oak trees that harkens back to a more graceful, simple time. Each Camp Axe is made in the USA with hand-ground 80CrV2 Steel. The blade is then cerakoted black. G-10 textured scales, Stainless Steel Fasteners, Lanyard Hole and a leather sheath.